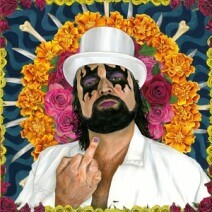 The legendary frontman from TURBONEGRO returns with a Rock & Roll masterpiece, after eight years of silence! “Egomania” is sure to become a standout record for every rock fan and will become a must-have for every Turbonegro follower. Eight years have passed since the world of Punk Rock lost one of their greatest. The legendary frontman from Turbonegro, Hank Von Hell, left the scene and stated that he would never return again. Fans all over the world have craved a return, begged him to reconsider. But Hank have firmly said “No”. Until now. Like the rise of a Phoenix, Hank Von Hell rises from the ashes and is once again re-born as Hank Von Hell.